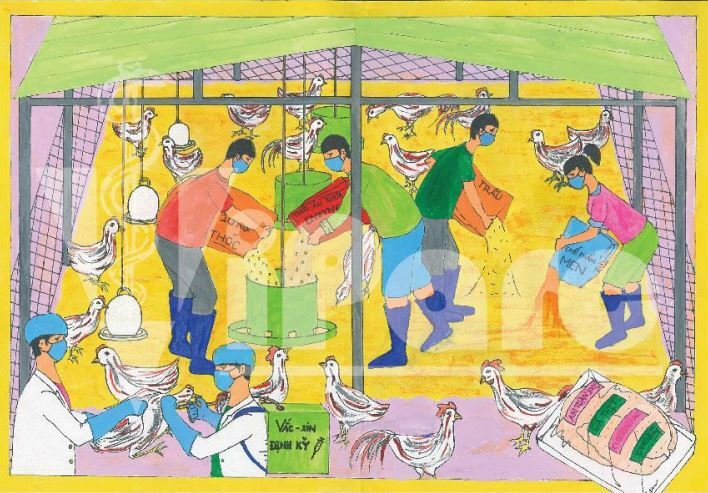 The painting titled "For Quality Poultry Products" by Le Thai Bao won the first prize at the “Stop Your Poultry from Binge-Drinking Antibiotics” contest. Oxford University Clinical Research Unit has presented ten prizes this week to the Vietnamese winners of a painting and photo contest it organized with two local partners over a month to raise awareness of antibiotic resistance in poultry farming. The ten best entries were honored on Monday in the Mekong Delta province of Dong Thap, where the unit cooperated with the Dong Thap Center for Health Information and Education and the provincial Department of Education and Training to organize the “Stop Your Poultry from Binge-Drinking Antibiotics” contest. The competition was meant to tackle antibiotic resistance in both animals and humans. After a month, the contest organizers awarded the first prize to Le Thai Bao and two second prizes to Nguyen Le Duy Thanh and Pham Thi Thanh Nha. They also gave away three third prizes and four consolation prizes. In his winning painting titled “For Quality Poultry Products,” 12th grader Le Thai Bao depicts good framing practices to restrict or eliminate the use of antibiotics on chickens, allowing farmers to produce clean and safe food. The other second-prize picture, “Four Criteria of Good Chicken Farming” by Pham Thi Thanh Nha, is about four criteria to raise healthy chickens, avoid infectious diseases, and thus prevent using antibiotics. The criteria Nha suggested famers should pay attention to are breed, food and drinks, insects, and vaccines. In her work, My painted a small household chicken farm where poultry are taken care of well. At the farm, the chickens’ foods are mainly sweet potatoes and rice. Sometimes farmers feed their poultry with spring onion to increase their resistance system and only use antibiotics under a veterinarian’s instructions when the chickens have caught infectious diseases. Meanwhile, Tran Le Huynh Thu, 18, named her third-prize winning painting “Let Me Tell You, Darling” as it showcases a couple discussing how to reduce antibiotics usage through such good farming practices as choosing strong chicken breeds and planning the right vaccinations. Thu believed that for any antibiotic reduction measure to work, farming couples should discuss more with each other, although sharing farming experience is uncommon among husbands and wives in rural Vietnam. In his work, Khanh pointed out that antibiotics prove an effective treatment for poultry when they become sick, so the problem is not the medicines but the people who abuse them. According to other contenders, reducing antibiotics usage in poultry production starts with a commitment to good farming practices. “Only when a farmer is fully devoted to his/her chickens will he/she feel urged to apply good farming practices for the sake of preventing bacterial infections, of reducing the need to treat his flocks with antibiotics,” Tran Thanh Nam, 17, said. Nam was among the 123 students from Thanh Binh 1 and Chau Thanh 1 High Schools in Dong Thap to have proposed novel ways to communicate about antibiotics abuse in Vietnam through photos, paintings and short essays. “Stop Your Poultry from Binge-Drinking Antibiotics” is a community-engagement activity under ViParc, a research project aiming to help farmers in the Mekong Delta raise healthy chickens with lesser amounts of antibiotics. The ViParc project is conducted against the backdrop of widespread antibiotics overuse and misuse in Vietnam’s farming sector, which is believed to be a major driver of antibiotic resistance. Such resistance refers to the ability of bacteria to avoid the mechanism of action of antibiotics, resulting in failure in the treatment of bacterial infections in both animals and humans. ViParc researchers recently confirmed the presence of colistin-resistant non-typhoidal Salmonella in pork purchased from a wet market in Ho Chi Minh City. It was the first time that bacteria resistant to colistin, a last-resort antibiotic, had been detected in meat in Vietnam.